by Betsy: Maryhill...how could I not? Thought I'd have a go at Joey's challenge again...Maryhill after all! And I'm so glad to see she challenged us NOT to put it in the center! Truly, the round Maryhill is a great way to learn the pattern, but there is SO MUCH MORE you can do with it! So I knew the Organic Maryhill that I posted recently, would work for sure in Joey's string, but what's the challenge in that? If you missed it, check out the step-outs here. Straight lines creating curves have been catching my eye lately. Joey provided us with a double circle string (think donut! ), and I thought perhaps I could form the center circle with lines. Turns out, it was pretty easy. 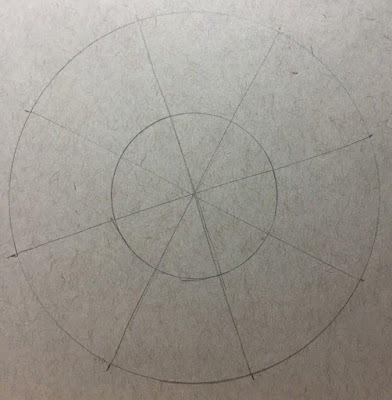 I drew a circle and made a mark every 15 degrees (I just came up with this arbitrarily but you do need a number that will go into 360 evenly). 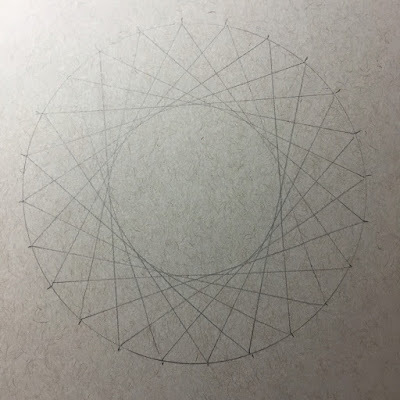 Then I drew a line between 2 of the dots so that the midpoint of the line was approximately where I wanted the edge of the center circle to be. In mine I think I skipped 7 and connected to the 8th. 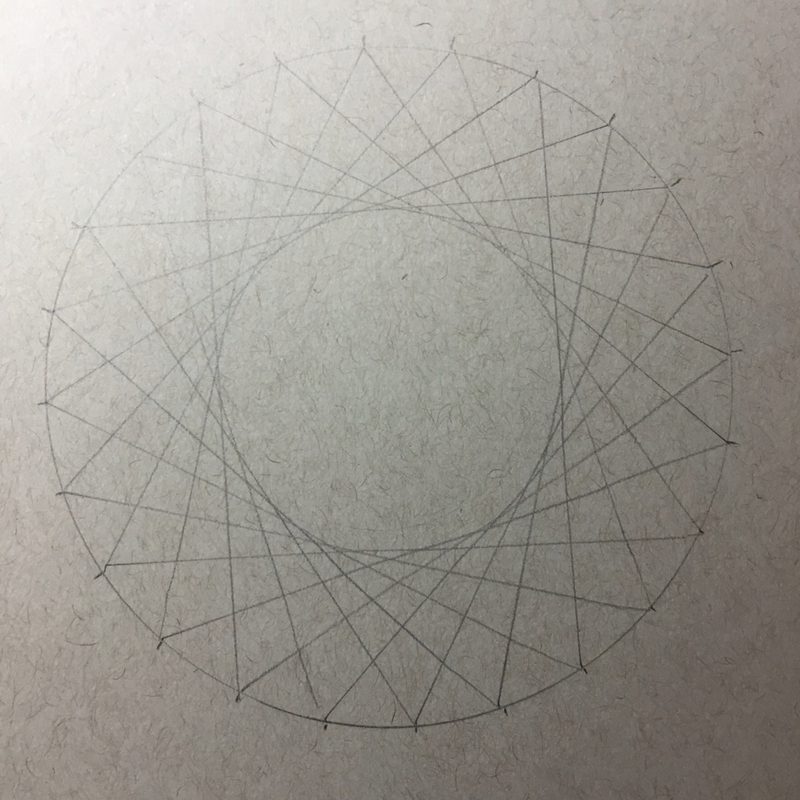 Then I just moved over 1 dot and continued around the circle. The hardest part was figuring out where to tangle, but I just started where it seemed the best fit, repeated around the entire circle and then picked the next spot. I also realized you can vary Maryhill slightly to begin and end in the same corner, like those diamond shapes... cool! I was going to leave this as a Maryhill monotangle but I'm so happy I decided to add Fescu to the center. 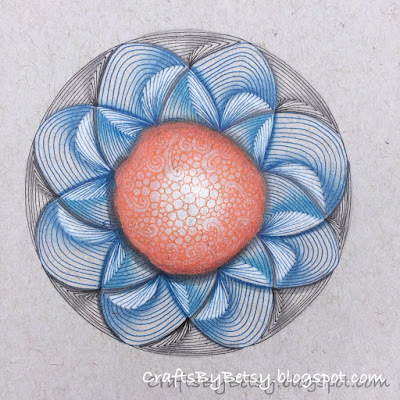 I used black and blue Sakura pigma microns, Graphik Line Maker in graphite, white Gellyroll, Fabrico gray marker, a couple shades of blue Polychromos, Zenstone, General's white charcoal and graphite. 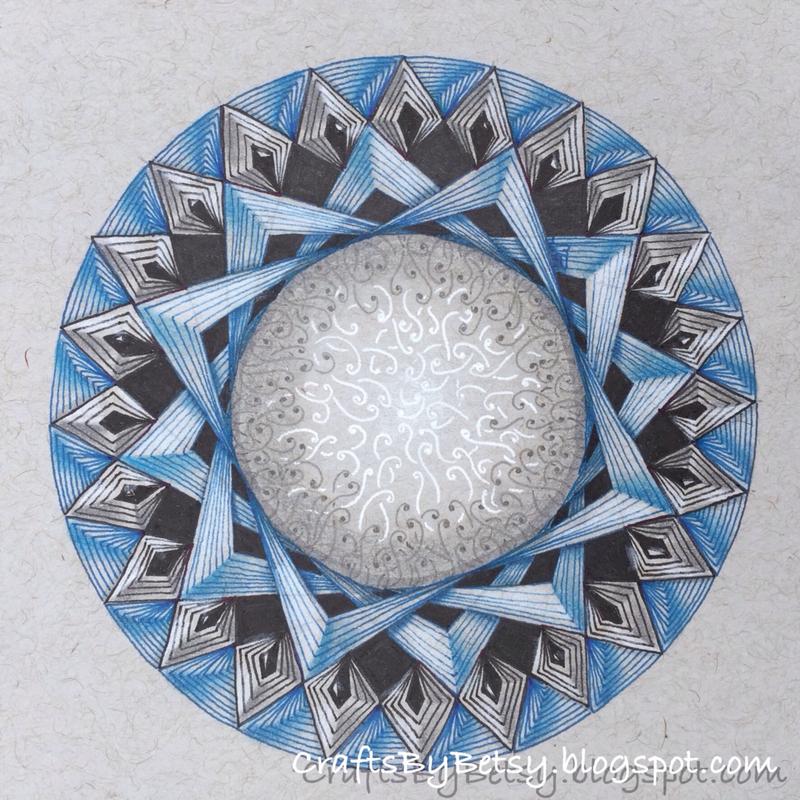 Both drawings are in my Strathmore Toned Gray 400 series spiral art journal. The white really pops on the gray. The spiral binding, however, was problematic for turning my work (I do a lot of that with Maryhill). Meanwhile, I was also working on this version. Here's how it started. 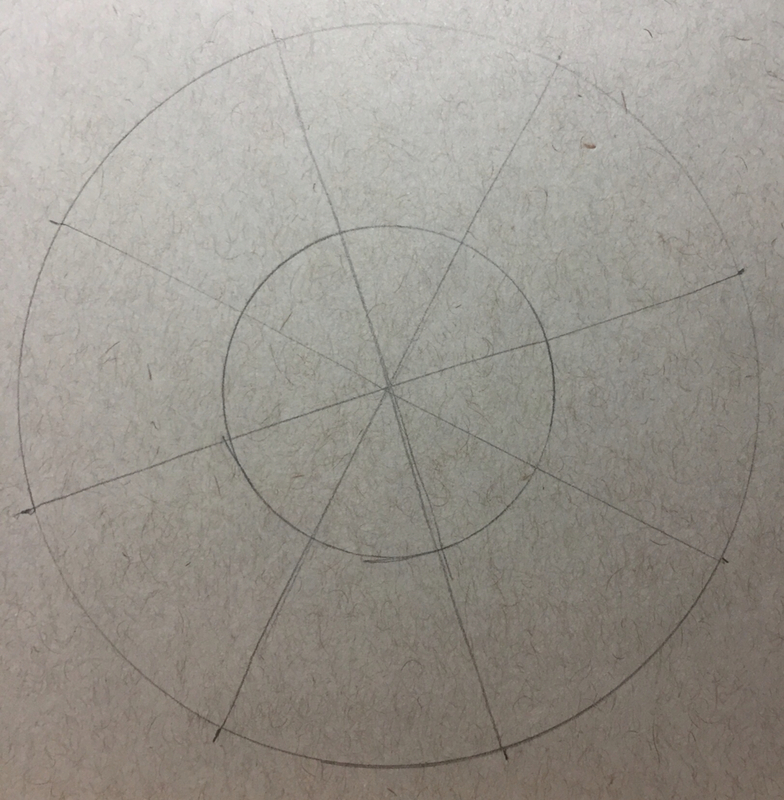 I was excited to try rounding the center of the tiles. 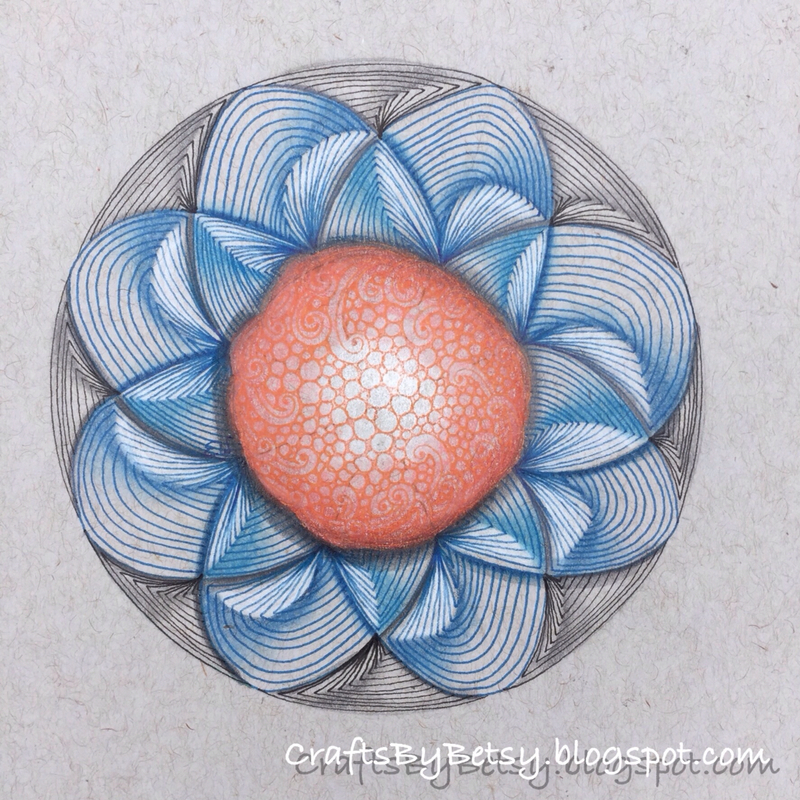 In addition to the tools mentioned above, I used an orange micron, and some orange shades of Polychromos. Tangles in the center of Maryhill are Floo and Tipple. That was fun Joey, THANKS! And, possibly, ending my current Maryhill craze, I present my bullet journal. 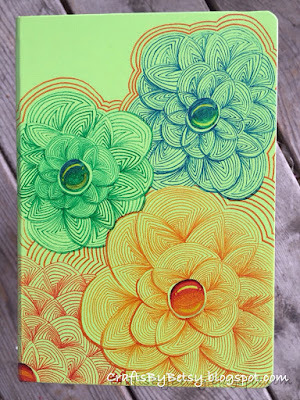 It is a Leuchtturm1917 in lime. I didn't do anything to prep the surface, just started tangling with Sakura's Identi-pens. Initially they worked pretty well and I was able to use the fine tip. Then I realized that my hand was lifting the ink. So, mid-way I got the bright idea to spray it with a workable fixative. While I do believe that stopped the ink from lifting, it also was preventing me from drawing easily. I think the pens were getting clogged with the fixative and it took lots of scribbling on paper to unclog them so they would work for maybe half of the next line. Primarily I was using the large tip after the fixative. 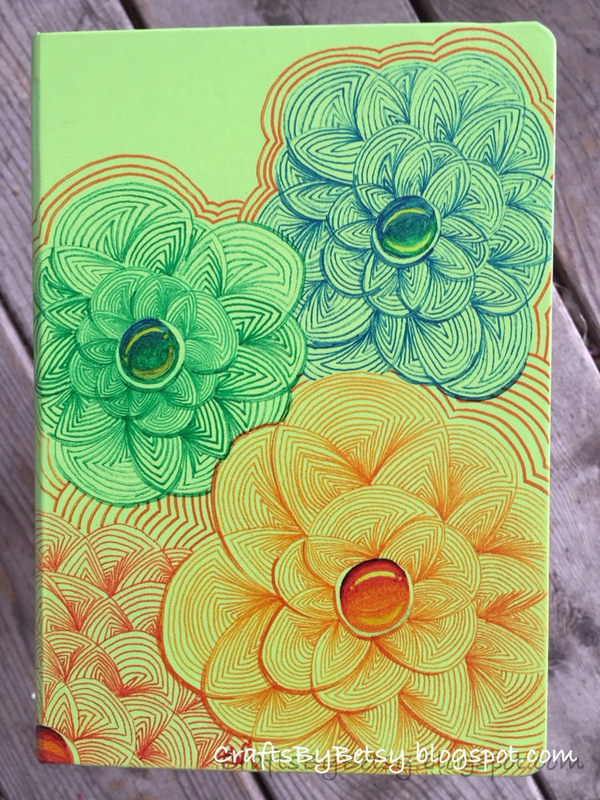 After completing it, I added another coat of fixative. We'll see how it holds up. Any suggestions for how to draw on this type of leatherette surface? You really did play around! Lovely tiles!